Imitation in Creative Businesses, is it the sincerest form of flattery? 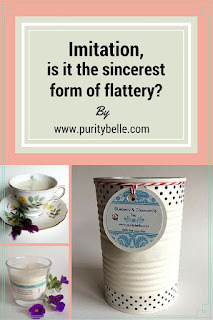 Imitation, is it the sincerest form of flattery? Firstly, just to clarify, being truly absolutely original is practically impossible, we all gather ideas and inspiration from a multitude of different sources and that's perfectly ok. 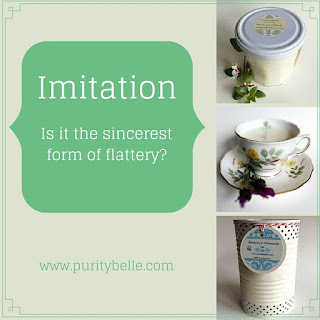 When I am talking about copying here, I'm really referring to direct imitation of a particular product or idea, sometimes right down to the finer details! What can you do about it? Very little to be honest – do, of course, make sure, if applicable, that you make use of patents, copyright etc. Otherwise, keep a positive attitude and maybe try some of the steps below. Firstly, it might be a cliché, but imitation is definitely flattering because someone has seen what you do and thinks it good enough to emulate. So give yourself a pat on the back! The second thing that occurred to me before I did any reading on the subject was that branding is so important in this situation – Addiebeads did a great post on branding and it’s so relevant here. Your product and business is not just about the individual items or ideas, it’s about the whole package – your attitude, ethos, style, look. This is where branding comes in. If you have every product associated with your brand, people will look for it, will know what you’re about and that your customer service is amazing (hopefully!) and will choose your product over someone else’s. That, to me, is the bottom line. You are King or Queen of your own business (guess who’s been watching Game of Thrones J ); you know every aspect of it and every detail that makes it what it is. Someone might lift a little part of it and think that they will end up with the same results as you do, but that’s just not the case. I also think it's really important to have faith in what you do and not judge it by what others are doing - we can be aware of our industry and constantly strive to improve but obsessing about what other business people are doing is more likely to stifle your creativity than benefit you. Another point, this one aimed at crafters specifically, is that you do need to be careful about what you reveal to people. Sad to say, there are individuals who really will have the brass neck to question you minutely about how you do things or where you source your supplies, and then go off and use that information to compete with you. I’ve learnt how to be very oblique and vague in my answers so that I can be polite without giving anything away! Of course I don’t mean that you should never help anyone – one of the lovely things about knowing other small business owners is the amount of support and advice that is offered. It's always nice to do the same and help others with your own experience. I’m just saying that in certain situations, it’s actually ok, and probably wise, to be reticent. Trust your own instincts I guess! Always remember that you’re the best and ignore the copycats! And don't forget to check my categories list for more posts on running a craft business. Business Networking, Good or Bad? I think many of us have been there, myself included, someone I thought of as a friend to craft with started her own business doing the same products as me (cards and jewellery) and undercut me. Although she had her own style as we all do it ruined our friendship and I wouldn't do it again. It's a shame though as crafters are generally the sharing type however we have to learn that not everyone is respectful of others. Totally agree Trish, that kind of thing does leave a bad taste alright and thankfully it's the exception because as you say, crafters do tend to be lovely helpful people as a rule!